RadioShack (RSH) may have scored a viral hit in February with its Super Bowl ad starring 1980s icons gutting one of its stores, but now it's going to need Hulk Hogan, Alf and the California Raisins for a much bigger demolition job. "The '80s called," an actor playing a RadioShack clerk tells a co-worker at the start of the Super Bowl commercial. "They want their store back." Well, the '80s apparently want a lot more of their stores back. The struggling small-box retailer revealed on Tuesday that it will close as many as 1,100 underperforming stores. 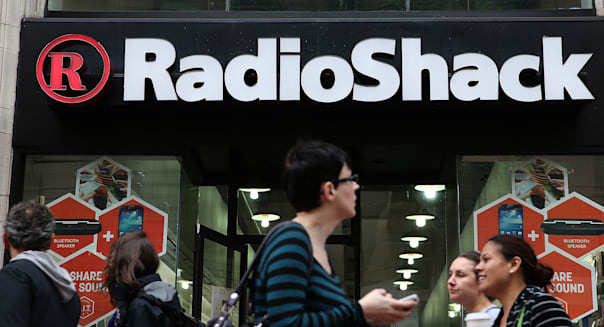 RadioShack's retreat is part of a grim quarterly report where sales fell sharply during the holiday quarter, fueled by a 19 percent drop in comparable-store sales. Losses naturally widened, and analysts who weren't banking on the chain turning a profit until 2017 at the earliest have every right to be even more pessimistic now. "Our fourth quarter financial results were driven by a holiday season characterized by lower store traffic, intense promotional activity particularly in consumer electronics, a very soft mobility marketplace and a few operational issues," its CEO explained. Yes, many chains had soft foot traffic in their stores this season. Winter was cruel. The shopping season was short. The Internet is warm, inviting and always open. However, few concepts are reprting a brutal 19 percent drop in comps. Market leader Best Buy (BBY) held up better. Best Buy's comps slipped by a little more than 1 percent during the same three months, and it would be closer to a 4 percent decline if you back out online sales that it bakes into its same-store sales metric. Best Buy also turned a profit, unlike RadioShack. Blaming the soft mobility marketplace should really be pointing the finger at itself since smartphone sales continue to grow in this country. All of the major wireless service providers showed improvement in their mobile operations. This brings us to the "few operational issues," but we shouldn't kid ourselves. RadioShack itself is an operational issue these days. Whether the chain is in denial or simply trying to put on a brave face, RadioShack claims to have a plan in place to return to growth and profitability. Its turnaround plan is centered around five pillars -- repositioning the brand, revamping the product assortment, reinvigorating the stores, operational efficiency and financial flexibility. %VIRTUAL-article-sponsoredlinks%The problem is that it has already taken a shot at the first three pillars when it chose to emphasize wireless services a couple of years ago. It figured that it could be the solution for folks wanting to do the carrier comparison shopping that isn't possible at wireless provider stores. Unfortunately Best Buy and the Internet had the same idea. RadioShack's Super Bowl spot was memorable, but it didn't do a very good job of communicating why anyone would want to go into one of the remaining stores. Updating the brand's image, products, and stores hasn't been easy, and it certainly won't come cheap. Now that the public's aware that hundreds of stores will close in the coming months it will be that much harder to succeed. That brings us to the final two pillars. It's hard to achieve operational improvement and financial flexibility when you're losing money. As long as the losses continue, there is little reason to believe that it will have more financial wiggle room, and cutting costs is rarely the solution to bringing in the store traffic necessary to complete a turnaround. RadioShack will still have more than 4,000 stores across the country after the purge, but there's little reason to believe that it will stumble upon a solution before its empire continues to contract in the coming years.